RESVANTAGE: more info about . . . 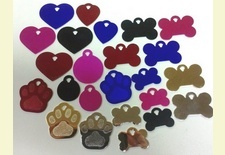 The National Canine Cancer Foundation has awarded RESVANTAGE CANINE their Pink Paw Seal of Approval for a "product that helps to advance the holistic health of our pets and helping fight canine cancer." This designation is granted only to companies who have met rigorous quality standards and other criteria established by their Scientific Advisory Board. 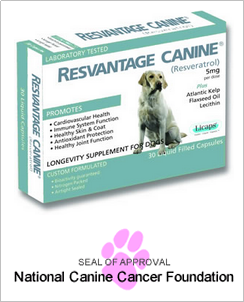 Resvantage is an all natural longevity supplement providing powerful support for your pet's health needs. 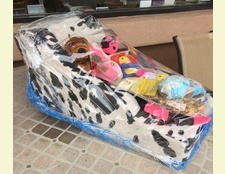 Improve the quality of your pet's life and keep your pet from acting old before his or her time! Just as in humans, nutritional supplements may be the best tool for maintaining health and preventing disease. 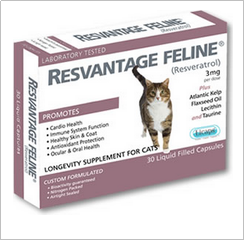 Used to supplement your pet’s overall diet, Resvantage Canine & Resvantage Feline contains resveratrol blended together with a unique combination of nutrients that work synergistically to help him or her reach full potential and diminish the many symptoms associated with aging. Resveratrol is one of a group of antioxidant compounds called polyphenols found in numerous plants and in red wine that has been reported to have anti-inflammatory as well as anti-cancer properties. Research has proven that resveratrol is the first compound to consistently prolong the life of several very different animal groups. Oxygen is the enemy of Resveratrol and many other natural plant compounds. In order to protect the resveratrol content in each capsule from degrading and to insure maximum potency, Resvantage Canine & Resvantage Feline are encapsulated by the Capsugel® division of Pfizer in an oxygen-free, nitrogen-rich environment utilizing their patented Licaps® process. And the liquid filled capsules are opaque, further protecting the resveratrol from losses due to exposure to light. A Nutritional Supplement manufactured to strict pharmaceutical standards insures that your pet is getting the highest quality and safest supplement available on the market today. Resveratrol is a type of polyphenol called a phytoalexin, a class of compounds produced as part of a plant's defense system against disease. It is produced in the plant in response to an invading fungus, stress, injury, infection, or ultraviolet irradiation. Resveratrol is present in 70 different plant varieties including: grapes, pomegranates, raspberries, peanuts, and other plants. What have Resveratrol studies found? The cell and animal studies of Resveratrol have examined effects in several cancers, including leukemia, skin, breast, and prostate cancers. Scientists are studying resveratrol to learn more about its cancer preventive activities. Recent evidence from animal studies suggests this anti-inflammatory compound may be an effective chemopreventive agent in three stages of the cancer process: Initiation, promotion, and progression.